In 1902 the US based company on production of sewing machines buys the site on Griboyedov Canal and plans to construct the building for shop and local board of the company here. The company has already arranged the production of sewing machines in Podolsk and opened about 3000 factory stores. The architect Pavel Syuzor planned to construct a new building on a large scale – eleven floors of "a real modernist style" that will rise about all beauty and sights of St. Petersburg. However, in the city there were the high-rise regulations: in the center it was forbidden to build residential and commercial buildings that surpassed the Winter Palace (23, 47 meters) in height. And the architect Syuzor found wise and cunning solution: first, the building could be seven-story due to the less high, than in other houses, ceilings, and secondly, the tower at the corner of the building could not get under restriction on height because it had exclusively decorative character. In such a way appeared an interesting angular tower that topped the built building in modernist style which was located exactly in the area of the Pulkovsky meridian. At the very top of the tower they fixed a sphere globe with a diameter of 2, 8 meters. It had to bear record to a large-scope of the Zinger Company’s activity. On the decorative ribbon surrounding the globe there is an inscription "Zinger and K". In those years the sphere was lighted with electricity internally and it was not only a bright sight, but also an advertizing of the company that was known by all Petersburgers. The tower is decorated by interesting sculptures. One part of the building is decorated by group of seafarers, and an angular part of a facade — is decorated by beautiful Valkyries, one of whom squeezes in hand a spindle and sewing machine — signature product of the company. One further peculiarity of the building - is a lack of sewer pipes that the architect hid in building walls. In the years of the Great War Company employees were accused of espionage on behalf of Germany. Only a few were aware that the company is US based, and its founder — the Jew that was born in Germany, but he didn't have German origins. And exactly Zinger bodkin military outer garment for the Russian army. Company owners decided to batten down the hatches, having delivered the first floor of the building under the USA consular agency and having ordered a huge sculpture of the American eagle that as if just flew from the image of a stars and stripes. In days of the New Economic Policy eagle disappeared. In December, 1919 Petrogosizdat and its warehouses moved to the building, but the representative office continued deploying in the house till 1922. Concurrently "Book Emporium" that occupied the first two floors of the building took up the residence inside. In the remained five floors there were editorial staffs and publishing houses. 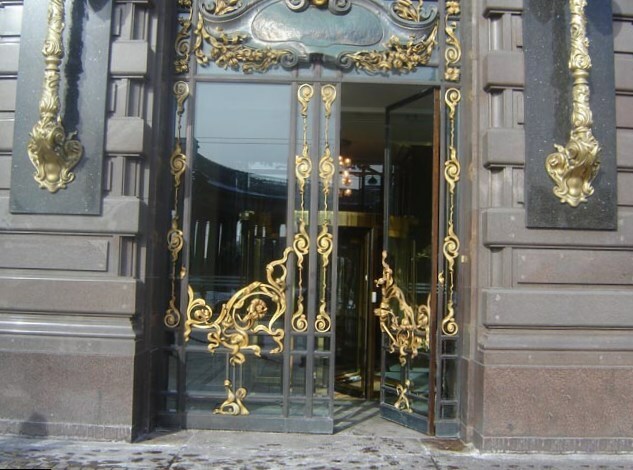 A lot of famous people liked to look in at the store: Alexey Tolstoy, Olga Forsh, Konstantin Fedin, Samuil Marshak and Daniil Kharms and many others. In the years of blockade the bookstore continued working. But in winter of 1941-1942 in a basement book-depository the pipes were ruptured, and the shop had to be closed. It opened only in 1948. The large-scale restoration is carried out in 2004 returned a former brilliant shape to the building — the main staircase was constructed, as well as hundred years ago, from marble, and in decorative elements they used a leaf-gold. Also the magnificent oak frames and doors, an inlaid floor, decorative forging and a graceful tile on courtyard walls were reconstructed too. 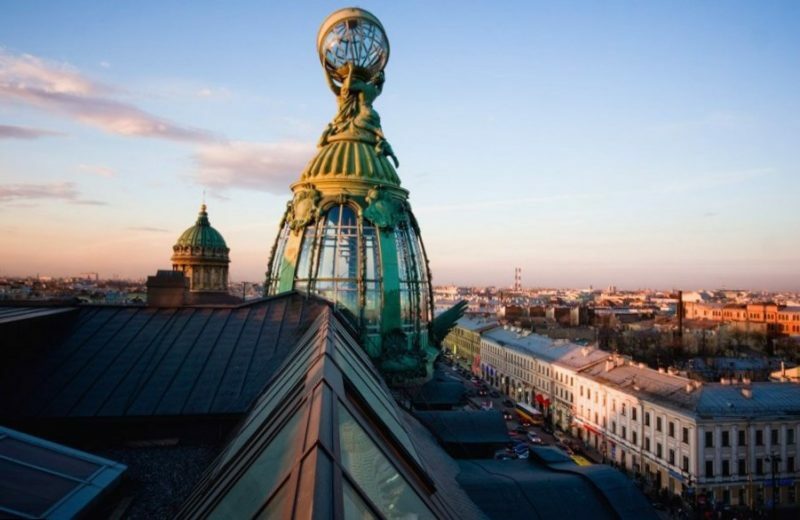 In the same year the external elevation was again decorated by an eagle figure, and the sphere globe since then every evening throws bright electric flashes on Nevsky Avenue, mysteriously sparkling with red and blue colors. 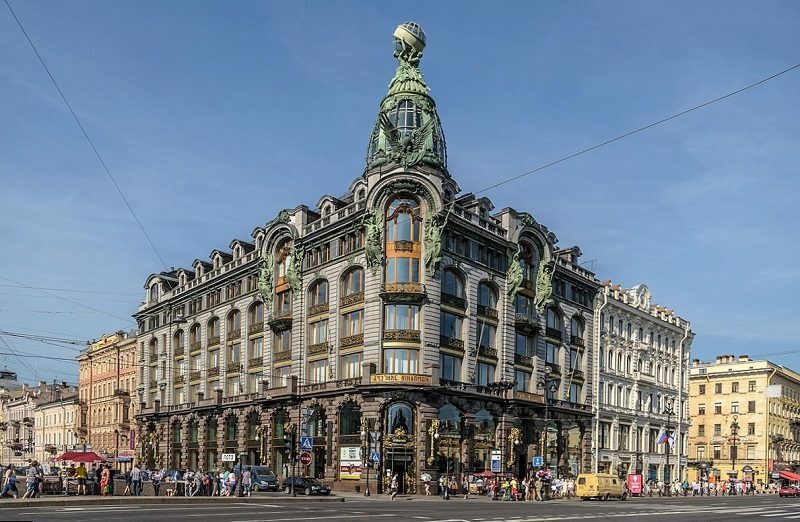 Now there is a bookstore located on two floors of the building, its area is 2800 sq.m, the top floors occupy offices, one of which belongs to the social network "VKontakte". Book Emporium, except sale of books, is also engaged in literature promotion. Experts on the printed word whose favourite saying is: "Those who don't visit Book Emporium lose a great opportunity" gather on the seventh floor. 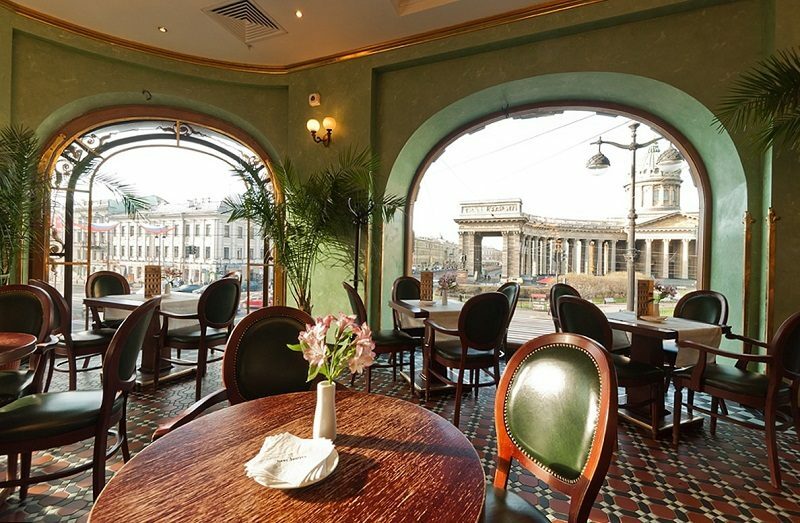 The Zinger cafe where it is possible to admire Nevsky Avenue and Kazan Cathedral relaxed atmosphere works from 09-00 till 23-00. It is located at the second floor. You can try dishes of Russian and European cuisine (the prices are high).